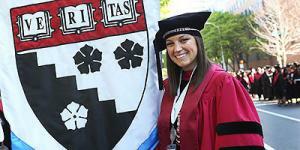 Adrienne Keene, Ed.M.’10, Ed.D.’14, found it hard to believe that her time at HGSE was coming to an end last week. “HGSE allowed me to find my voice as a scholar, activist, and educator, and I gained the skills and knowledge that will help me to continue the community based research and work in Native communities that I am so passionate about,” she says. When Keene arrived at the Ed School, the doctoral marshal came with an eagerness to study an issue near to her heart: the education of Native people. Having won a Spencer Dissertation Fellowship last year, Keene focused on understanding college access for Native people. Her research entitled “‘College Pride, Native Pride’ and Education for Nation Building: Portraits of Native Students Navigating Freshman Year,” is a portraiture study that follows four alumni of College Horizons -- a college admissions workshop for Native American, Alaska Native, and Native Hawaiian students -- in their college transition, through their freshman year, and into the Fall of their sophomore year. She’ll continue studying her passion after graduation as she heads to the Center for Indian Education at Arizona State University, where she’ll work as a postdoctoral fellow. But ultimately, Keene’s goal remains similar to when she began: to understand how to get more Native people into higher education.